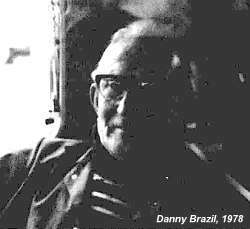 The death of Danny Brazil in September, a few days short of his 90th birthday marks the end of an era. He was the last surviving member of a large family whose repertoire of traditional song and dance was enormous. His parents were Londoners, who made a living dealing in horses and they kept to the travelling lifestyle, they were "very old-fashioned people - very old fashioned". Lemmy, Danny's older sister, was born outside Southampton, following which the family moved over to Ireland where they travelled for 27 years. Ireland is where Danny was born, although he was always at pains to emphasise that he was English. Lemmy said "I've been to every town in Ireland. We used to stop for a week, sometimes two, then move on." The family lived in two horse-drawn wagons, with the parents in one and the children in the other. Lemmy and her seven sisters used to ride the horses to the fairs, and then hold them while they were being sold. "Over there we used to go down the pub, have a sing, get drunk and sing down the road on the way home. They don't do that round here [Gloucester]. They don't know how to enjoy themselves." When the family returned to England, they came to Gloucester. Their father sold all his horses at Gloucester market after which they dealt in rags and scrap iron, whilst the children made a living with cars and trucks. Lemmy had a second-hand shop in Gloucester's Westgate Street and Danny served throughout the Second World War as an ambulance driver, seeing service in Poland, Holland, France "and all over". Music and dance were a major influence in their lives and all the children appear to have been able to play an instrument, (even if it was only a couple of stepdance tunes on mouth organ), to 'tap dance' to, and all of them sang. Lemmy played for stepdancing in Ireland, when that form was almost identical to the stepping seen in England with the dancers competing by dancing on a square board. They would put a big coat on her and as she played they would throw money into her lap. Their parents were the main source of their material, especially their father - "He knew hundreds of songs"
Peter Shepheard spent some time during the late 1960s making copious tape recordings, not only of Danny, but also of his brothers Tom, Harry and Hyram (who was, however, a more reluctant performer) and his sisters Lemmy (Lementina) and Alice Webb. These are a remarkable document of traveller culture in Gloucestershire at the time. Some of the tunes were transcribed and offered to Bertrand Harris Bronson for use in his massive Traditional Tunes of the Child Ballads, although none of the recordings have ever been made available to the public. Shepheard did, however, type the words of the songs he collected, and presented these to the members of the family in book format - a gesture which Danny certainly appreciated all his life, despite his inability to read. Once when we visited Danny he complained that one member of his family had borrowed the book and he had never got it back - he was genuinely thrilled when Gwilym Davies and I were able to produce a new copy for him. Later the family were recorded by Gwilym and by Mike Yates, and several of these recordings have been issued on compilation records published by Topic, and have appeared in the recent 'Voice of the People' series. Some years previously, Harry and Danny had fallen out during strawberry picking, and during the ensuing scrap, a blow to Danny's throat ruptured his voice box, and left him with a harsh, croaking voice which continued to deteriorate throughout his life - although a tune could be made out at the core of his singing. Danny, however, appeared to be regarded as one of the most talented - both as a stepdancer, whose reputation is still strong, although he had not danced for many years, and a singer, despite his ruined voice. He described himself as a "light tenor" and the loss of his "instrument" obviously affected him strongly. He regretted the disappearance of performance opportunities and welcomed visits when he could talk about and sing "the old folk songs". To this end, he realised that the 'old' songs he knew were an anomaly in the modern world, and was anxious that they were recorded by Gwilym so that there would be a tangible record, not just of his repertoire, but of the fact that they would be available for other people to sing in the future. Even the last time we saw him, a few weeks before his death, he was telling us that there were many more songs that he wanted to sing to us, and to be sure to bring the tape recorder on our next visit. He had also taken Peter Shepheard to other singers in the area for the same reason. If he had a song in common with Harry, he would often say "don't forget, you got that song from me" after a recording. He had a huge repertoire, not just of the old songs, but of many popular and country and western songs, all of which he had considered and had decided on their type and function - in order that he could easily produce the right song to match the occasion. 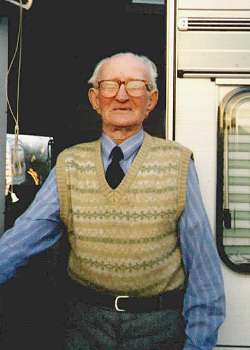 He loved music, and was disappointed that none of his children or grandchildren appeared to be interested in "the old Irish songs" as they called them - an inaccurate generalisation. Lemmy had some unusual songs - songs which the others in the family didn't sing - The Cruel Mother was one of hers, and Bonny Black Hare, whilst both she and Danny sang Shot Like A Bird On A Tree, which has only ever been noted on two other occasions, once in Ireland and once in Newfoundland. Harry had a fine tenor voice and his songs were often carried by some luxurious modal tunes, although over the years he had often telescoped the words to produce more compact versions than those sung by his brothers and sisters. He suffered from angina and this prompted him to give up singing several years before his death. Danny never really got over the death of his wife, after which he never left the site, although he remained bright and sharp to the end. He had lately suffered bad health, but had successfully come through an operation to amputate his leg. Luckily, he lived next to his daughter Doris, who ensured that he enjoyed his life. His funeral was well attended, with two lorry loads of floral tributes (the first time I've seen a floral tribute in the shape of a bottle of Bell's whisky!). All Gwilym's recordings and Mike Yates' recordings of Danny are in the National Sound Archive and can be listened to by appointment. Which contains Harry Brazil singing A Blacksmith Courted Me, The Flower Show, Sally Monroe, Bold Keeper, The Gown So Green, and Lemmy Brazil singing The Bonny Black Hare and playing God Killed The Devil Oh! It also contains Debbie and Penny Harris, two of Harry's grandchildren singing Barbara Allen. Contains Harry Brazil singing Sally Monroe, A Blacksmith Courted Me and Lemmy Brazil playing God Killed The Devil Oh! Bronson, Bertrand Harris, The Traditional Tunes of the Child Ballads, Princeton University Press, 1959-72, 4 vols. Davies, G & Palmer, R, Come Let Us Be Merry, Green Branch Press 1997. Contains Lemmy Brazil and Alice Webb (née Brazil) versions of Bitter Willow (Bitter Withy), and Danny & Lemmy Brazil's version of Come All You Lucky Gentlemen. Yates, Mike, Three Brothers in Fair Warwickshire, in English Dance and Song, Vol 45, No 1, Spring 1983. Contains an article on Danny's version of this song and how close it is to a published broadside.